With the aging of our population, pelvic organ prolapse is an increasingly common condition that negatively affects patient quality of life. Vaginal vault prolapse has been reported to occur in as many as 18.2% of all women with prolapse , and many would suggest that vaginal vault prolapse is a component of most high-grade anterior compartment descensus. 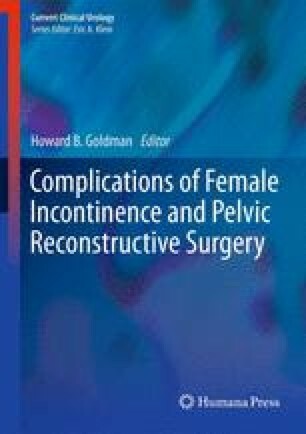 Several repairs exist that reconstitute support to the vaginal vault, and certainly there is no single procedure that is optimal for all patients. Abdominal sacral colpopexy (ASC) offers an effective and durable repair for vaginal vault prolapse . It maximizes functional vaginal length and approximates the normal vaginal axis . ASC should be considered especially in patients with failed prior vaginal repairs, isolated high-grade apical prolapse, and in younger patients with apical prolapse who would like to maintain sexual function . The procedure may be performed open, laparoscopically, or robotically. In our experience, the key components of the operation though the open or robotic approach include utilization of a permanent, type I macroporous mesh, secure suture fixation of the graft to the sacral promontory and vaginal cuff (Fig. 6.1), complete enterocele reduction and culdoplasty, and the addition of concomitant anti-incontinence procedures as indicated . We affix the vaginal portion of the graft with multiple sutures to distribute the tension evenly over the vaginal apex (Fig. 6.2), and avoid excessive tension between the apex and sacrum (Fig. 6.3). We routinely close the peritoneum over the mesh arm. In this chapter we will address the recognition and management of complications potentially associated with this method of the repair, as well as outline complications that have arisen from other variations.